Greenleaf Book Group Press, 9781608325733, 184pp. The most powerful word in wealth building is choice. Don t limit your financial future based on conventional wisdom. Understand your personal financial drivers, take control of your money, and leverage it to create your ideal future, not somebody else's version of security. Investment expert Kimberly Foss offers the insight and tools you need to confidently design your investment plan and make your own choices. By guiding you through the five foundational principals of investing, she prepares you to map your course with integrity. Goal setting: Life experiences, desires, personality, and more help determine your goals. Planning: Hope, dreams, and opportunity don t mean anything if you don t have a plan. Commitment: You must be committed to your purpose. Assessment: To stay the course, first make sure you are actually on course. Flexibility: As long as the unexpected can occur, investors must be poised to take action when necessary. Drawing upon her twenty-six years of experience as president and founder of Empyrion Wealth Management, where she advises clients of all financial backgrounds and life situations, and her own rise from humble beginnings, Kimberly offers powerful and enlightening stories. Through them, you will learn how to leverage personality, situation, and belief and apply proven wealth-building strategies to fulfill your needs and dreams. 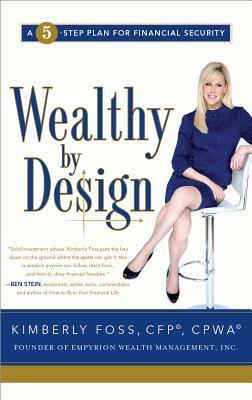 Investment empowerment in five easy steps, "Wealthy By Design" will lead you to the future of your choosing. Kimberly Foss, CFP, CPWA, is the president and founder of Empyrion Wealth Management, which has been named one of the nation s top wealth managers by Bloomberg s" Wealth Manager Magazine." She has more than twenty-six years of experience helping people achieve their financial goals. After beginning her career with Merrill Lynch, she started her own advisory firm to fulfill her commitment to helping clients make smart financial decisions and avoid costly mistakes. Each year since 1998, Kimberly has been awarded the DALBAR seal, a designation awarded to financial professionals who meet stringent requirements of the SEC and receive high ratings from their clients. She is also a member of the Investment Management Consultants Association. "